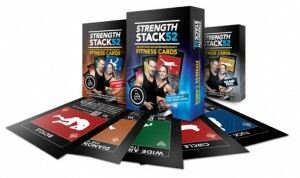 Strength Stack 52 Training Cards is a set of playing cards that also have various exercises on them to help you get in shape and gain strength. They're up on Kickstarter and looking for funding. They've made their goal, so it's stretches... heh... for the next 12 days. With Strength Stack 52, you can play games by yourself or with a group of people. Games take anywhere from 5 minutes to over an hour to play, depending on which game you play. Games can vary from solitaire style warm up games that last only a few minutes, to multiplayer intense workouts that last long enough for you to be very sore the next day. You are limited only by your imagination. Discover games created by other players or invent your own.